You are throwing the best party for your little one and you want to be the most remembered host in the whole wide neighbourhood? The Happy Balloons Bouncy Castle is the perfect addition to your marvellous event that your child will absolutely adore. The Happy Balloons Bouncy Castle measures 15.5ft x 12.5ft x 11ft and requires only 18.5ft x 15.5ft x 12ft of your garden, park or field. Awesome, right? You must be thinking that it will cost you a fortune. You’re wrong! 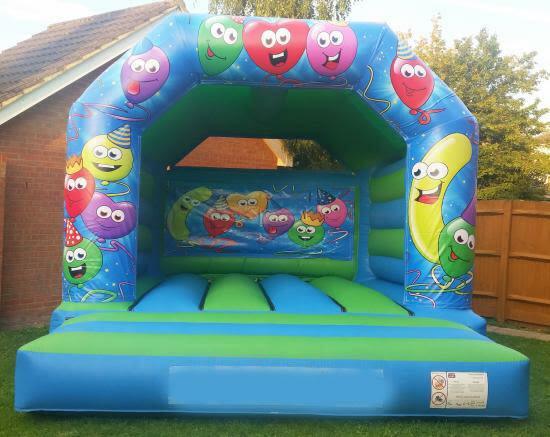 This bouncy castle costs you just £55 and only £20 extra if you want the jumping adventure with the happy balloons to continue overnight. Wait until you hear this! The price includes the whole setup, inflation, deflation and collection, which is exclusively done by our team, together with a circuit breaker, safety crash mat, blower, extension cable and a rain cover to protect your dearest one and the little guests from the bad weather. Chase away the questions about the safety, because we are the ones that are responsible for it. All of our bouncy castles are certified. Your children’s safety is the single most important thing to us. All you have to do is rest yourself and have the time of your life together with your little host. Hire this bouncy castle through our contact form, email info@kcbouncycastlehire.co.uk., or simply a phone call to 07760 753308 and earn the biggest hug from your child!